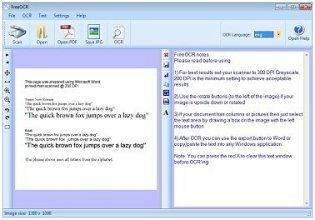 FreeOCR is free optical character recognition software for Windows that can scan text from most Twain scanners, and also supports PDFs and TIFF images. It will output plain text and can export directly to formats for Microsoft Word, making your job much easier. It can also scan and save images as JPEGs.